Step out in autumnal glamour with our embroidered pearl pink ball gown. Exclusive to David Charles, this polished girl’s gown is the epitome of new season luxe. Whether your angel needs a sophisticated style for a wedding ceremony, pageant or party, this charming edition will ensure she looks radiant whenever the occasion calls for refined elegance. 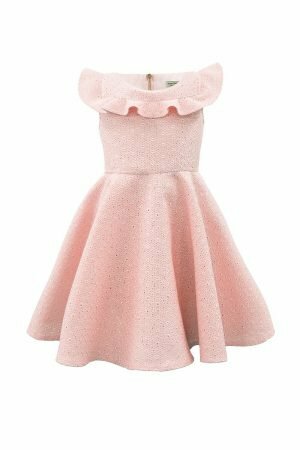 Available in a pearlescent pink colour palette with subtle metallic stitching throughout, note how our unique leaf motif creates a signature look ready for your little one to welcome her next upmarket event like a fairy princess. With a soft ball gown silhouette and dramatic puff sleeves, this statement gown is hand-finished with a bow on each sleeve to add an instant air of opulence. Includes a concealed zip to fasten.